The popularity of the Spartan Race has given rise to an entire class of products that are designed specifically to aid athletes in acing these races with minimal hassle–which is what brings us to the best hydration pack for a Spartan Race. We have reviewed a variety of hydration packs with different price entry points and USPs. Take a look at what we found to help you choose the perfect pack. Completely adjustable shoulder and chest straps that would easily fit XS to XL sizes. Hydration bladder (water chamber) is made of food grade storage material approved by the FDA. Additionally, it’s also BPA free. Also includes two additional chambers, large enough to hold clothing items, phones, and other accessories. More stuff can be added to stretchable mesh pockets. Large bladder opening allows addition of ice cubes, sturdy enough to be used as a pillow. 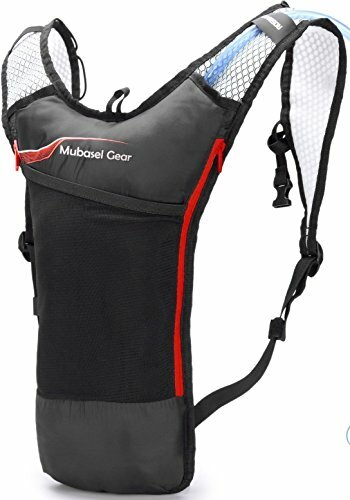 Mubasel’s hydration pack is leak free, lightweight, and designed to carry upto 70 oz of water that could last an entire day of racing. 60 days return policy, that’s a long window to test it and get your money back if you aren’t satisfied. Easy cleaning with warm water. Bite valve is extendable, making it easier to reach and drink from, on the run. At $26, this is perfect for a few races. Shoulder straps are rough, chafing and irritating the skin underneath. Drying the bladder before reuse takes time as the sides stick together, retaining moisture. Lightweight bag and materials used, so durability is compromised. Bite valve quality could be improved, sometimes requires additional pressure and tipping to get the water flowing. 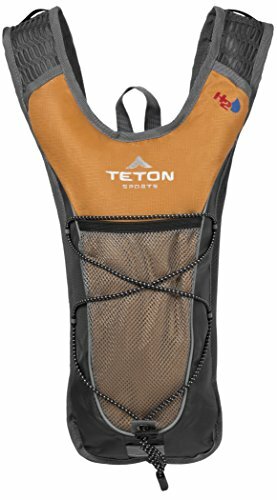 Teton hydration pack’s USP is its compact size. Fits in 2 litre water bladder that’s BPA free. Long drinking tube with high-quality bite valve. Nylon Fiber construction, cushioned, and durable. Available in 5 different color combinations. Mesh shoulder straps do not dig in. Only $20 for a very durable product. 1. Bladder chamber and storage compartments are only thinly separated. Adding ice would soak the chambers. 2. Good for short duration activities. Longer races would require better-insulated chambers and more water storage capacity. This heavy duty Polyester bag comes with a 2.5 litre hydration bladder. Robust exterior made of 600 Denier Polyester material with PVC lining. Easy to use extended hose with high quality bite valve that draws water with a gentle bite. Emergency whistle buckle, additional modular light weight load carrying equipment (MOLLE) system to attach tactical accessories such as flash lights. Mesh padding in the back, breathable and easy to use, comfortable straps do not chafe even with long duration use. Waterproof material, doesn’t soak through the chambers on adding ice to the water pack. Bite valve has a cap, keeps the tip clean. Comes in two color variations for a price of $42. Not exactly competitive but good value for money. Additional waist belt to spread the load evenly and keep the backpack from bouncing. Managing the chest and shoulder straps is a bit iffy since they do not extend as much for someone with a bulky frame. Sometimes water tastes like the hydration bladder’s plastic container needs improvement. G4Free offers a lightweight backpack for sports activities with a 3 liters hydration pack included. Detachable hydration pack can be replaced, easy to wash and dry between uses. The bladder can be secured snugly inside the bag thanks to the top hooks that prevent it from moving around inside the bag while you are on the move. Large backpack with additional storage chambers for items like phones, keys, etc. Insulated bladder and tube, keeps water cold for long durations. Water resistant, high-density polyester fabric, with construction ropes and buckles. Adjustable chest, shoulder and waist straps. Molle webbing that allows you to attach or clip on and carry even more accessories. 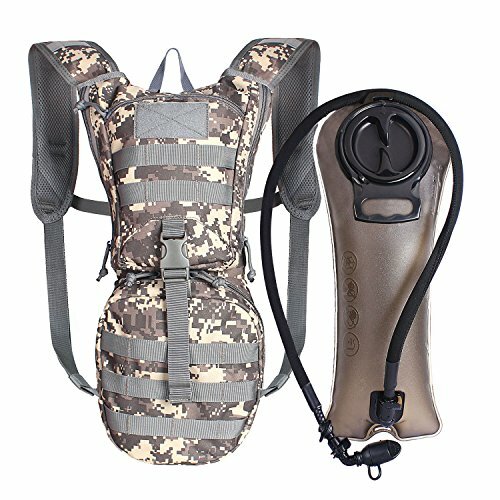 At $25, this hydration pack would be an ideal companion for any long duration Spartan race. Bladder requires multiple wash and dry cycles before use, else the water has a plasticky taste. After use and wash, the bladder needs to dry out completely to avoid trapping moisture and odor. Designed to have storage pockets on the back, inconvenient to reach when you are in the middle of a race. Shoulder straps have no padding, making them a little uncomfortable for long duration use. Water tube is too long, swings along with movement. Needs to come with a clipper to easily attach it to the straps. 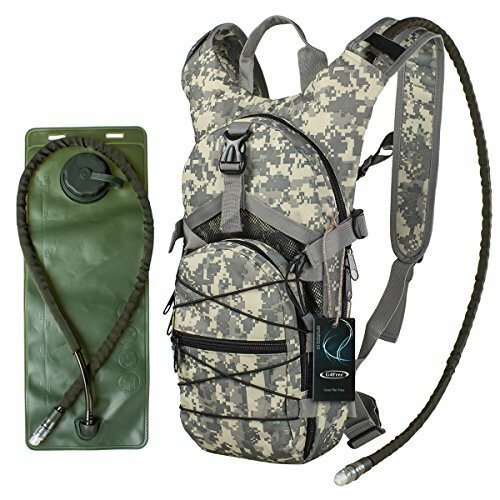 We recommend going for hydration packs that come with adjustable waist straps and well-insulated hydration bladders to maintain water temperature. Also, pay that extra amount for padded and breathable mesh shoulder straps. Good luck in your Spartan adventure!